are available now. More will be added soon. Note: Works with Windows 2000 and XP, does not work with Windows 7. In German genealogical research one of the most difficult problems to solve is finding the village of origin of an immigrant. 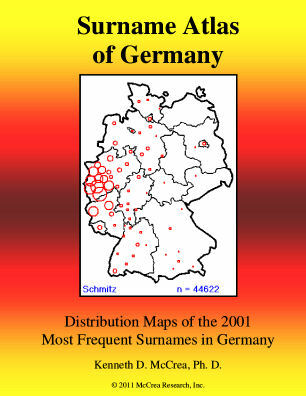 One easy place to start is to look at the distribution of the surname in Germany today. Even after hundreds of years of internal migrations, many surnames (especially the less frequent ones) are either limited to a small area, or are most numerous in their place of origin. To produce maps from phone listings I created a program which can map the German phone listings. This provides a quick and easy way to start your search for your German roots. Copyright 2012 by McCrea Research, Inc.